POSTCARD – CRAPLE BRIDGE – “BUILT OVER CROY’S CREEK IN 1889 IN PUTNAM COUNTY NEAR BRIDGE, INDIANA. 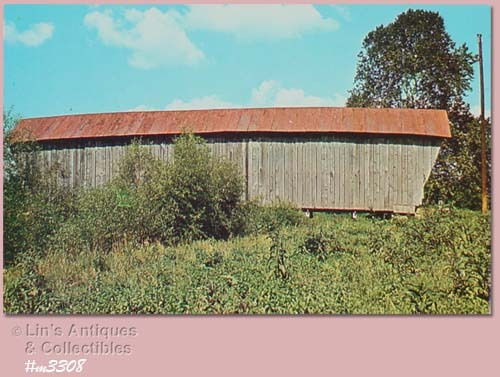 IT IS 71’ LONG AND 16’ WIDE.” POSTCARD IS IN EXCELLENT CONDITION BUT HAS A DRIP SPOT ON BACK. 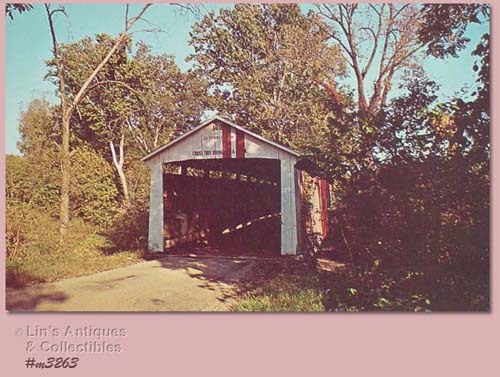 POSTCARD – “PUTNAM COUNTY, INDIANA, 14-67-09 RUARK BRIDGE (LOCATED 2 ½ MILES S.W. OF GREENCASTLE). BUILT 1901 OVER BIG WALNUT CR. 1 SPAN BURR ARCH 160 FEET”. PER CARD, THIS IS “UNION COUNTY OHIO NO. 35-80-01” AND IS LOCATED “2 MILES S.W. OF POTTERSBURG”. 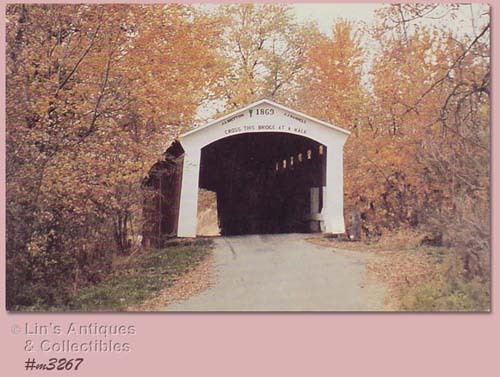 PER POSTCARD, THIS COVERED BRIDGE IS LOCATED “ONE MILE NORTH OF MT. HEALTHY, OHIO” AND IS THE “ONLY REMAINING COVERED BRIDGE IN THE COUNTY”. POSTCARD IS IN EXCELLENT CONDITION, BUT THE PRODUCTION RUN CUT OFF THE FIRST LINE OF THE DESCRIPTION WHICH PROBABLY CONTAINED THE NAME OF THE BRIDGE. ISN’T THIS A PRETTY POSTCARD? 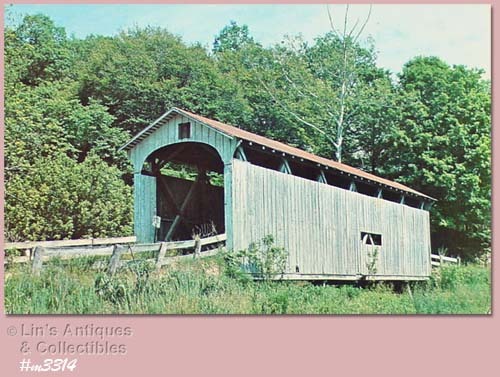 IT’S COVERED BRIDGE KNOWN AS “MORGAN CO. #35, LOCATED 1 1/2 MILES S.W. OF EAGLEPORT, OHIO”. 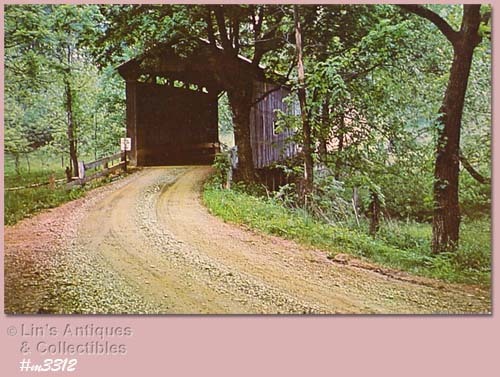 PER POSTCARD, THIS BRIDGE IS KNOWN AS “VINTON COUNTY #4” IS LOCATED IN “JACKSON TWP. 33” , AND WAS BUILT IN 1875. 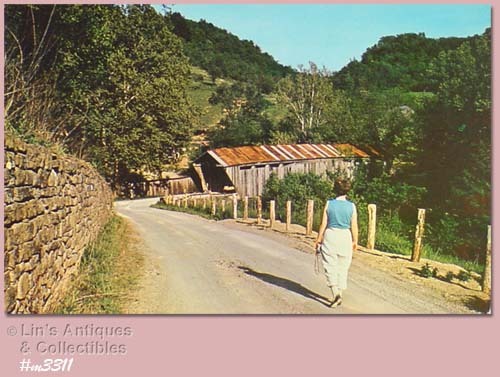 POSTCARD IS IN WONDERFUL CONDITION, PRIOR OWNER WROTE “VINTON 4” ON BACK. 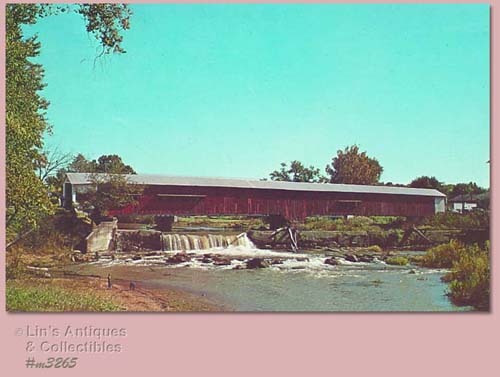 PER POSTCARD, THIS IS “SALT CREEK BRIDGE – MUSKINGUM COUNTY #31”. 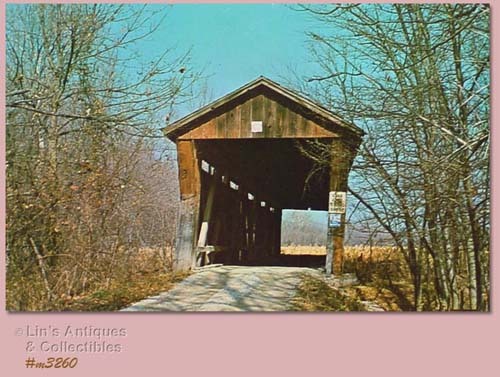 CARD ALSO STATES THAT IT IS “THE ONLY REMAINING BRIDGE IN OHIO WITH WARREN TRUSS CONSTRUCTION”. 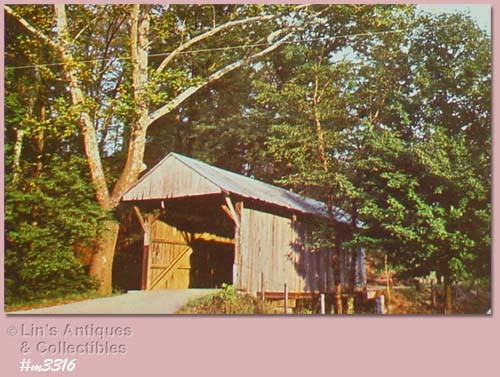 POSTCARD IS IN WONDERFUL CONDITION BUT PRIOR OWNER WROTE ON BACK “THE OHBA OWNS THIS CB! WE BOUGHT IT IN 1960”. PER POSTCARD, THIS IS “THE ROOT BRIDGE #8” LOCATED “S. OF QUALEY, NORTH OF DECATURVILLE, OHIO”. 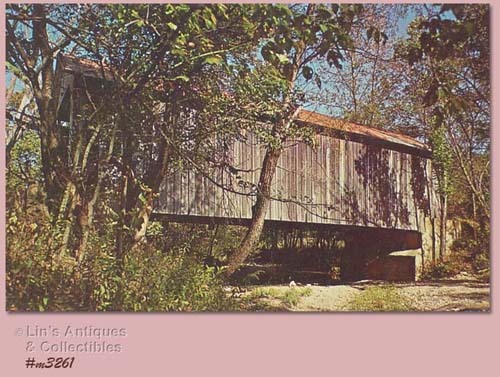 POSTCARD IS IN WONDERFUL CONDITION – PRIOR OWNER WROTE ON BACK “CB IS NOW PAINTED RED”. NEAT POSTCARD! 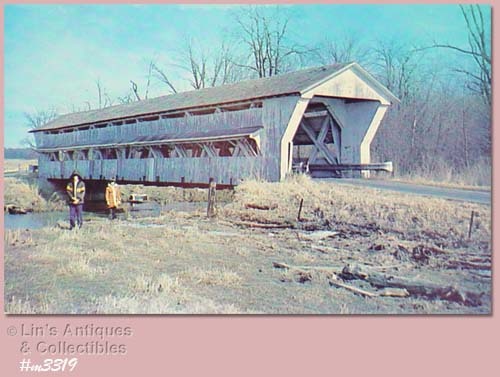 PER CARD, THIS BRIDGE IS THE “ONLY ONE OF ITS KIND IN OHIO” AND WAS “BUILT IN 1831”. 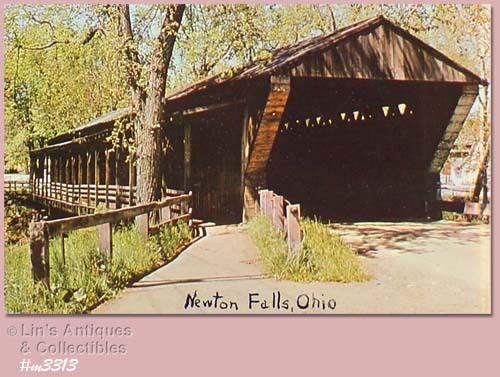 POSTCARD IS IN VERY GOOD CONDITION BUT PRIOR OWNER WROTE “NEWTON FALLS, OHIO” ON FRONT AND “TRUMBULL” ON BACK. 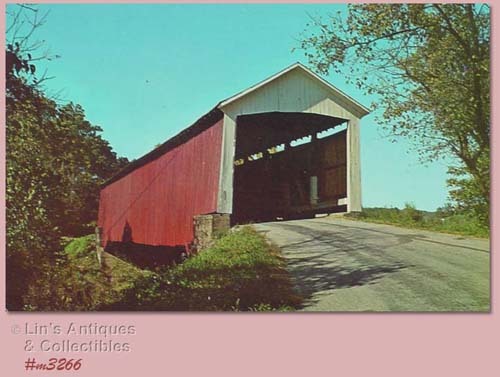 “THE HENRY” OR “WASHINGTON COUNTY #6” COVERED BRIDGE IS LOCATED “W MILES NORTH OF CUTLER, OHIO”. POSTCARD IS IN EXCELLENT CONDITION BUT PRIOR OWNER WROTE “WASH NO 6” ON BACK OF CARD. 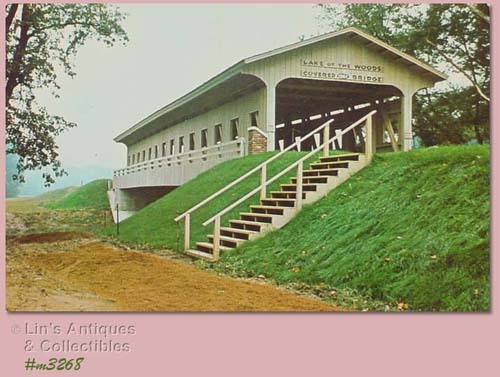 PER POSTCARD, THIS IS “SCOFIELD COVERED BRIDGE IN HUNTINGTON TWP., BROWN CO., OHIO (33-08-21)”. POSTCARD IS IN EXCELLENT CONDITION BUT BACK HAS HANDWRITTEN NOTATION “BRIDGE IS NOW IN STORAGE”. 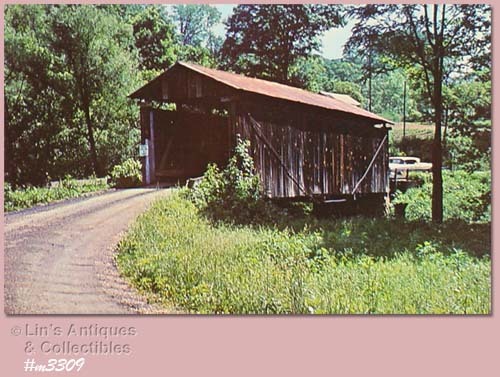 PER POSTCARD, THIS IS THE “75’ CAIN ARCHER COVERED BRIDGE #29” OF NOBLE COUNTY”. POSTCARD IS IN EXCELLENT CONDITION BUT BACK HAS HANDWRITTEN “NOBLE 29” AND “REMOVED YEARS AGO”. 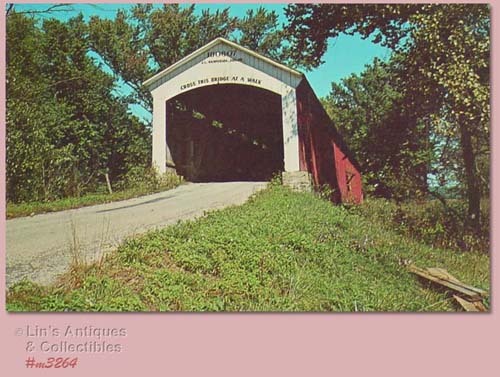 PER POSTCARD, THIS WAS NAMED “THE WILLIAM’S” BUT WAS LATER KNOWN AS “MARTIN BRIDGE” AND WAS LOCATED IN WASHINGTON COUNTY, OHIO. 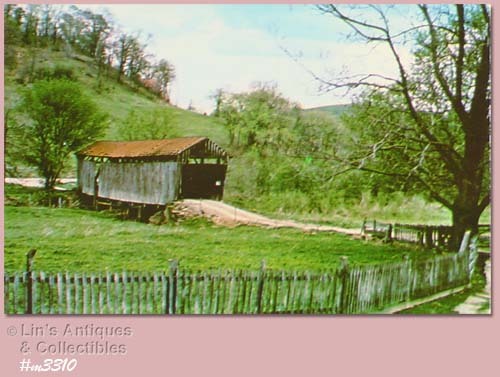 IT “WAS VICTIM OF A FLASH FLOOD MARCH 4, 1963”. 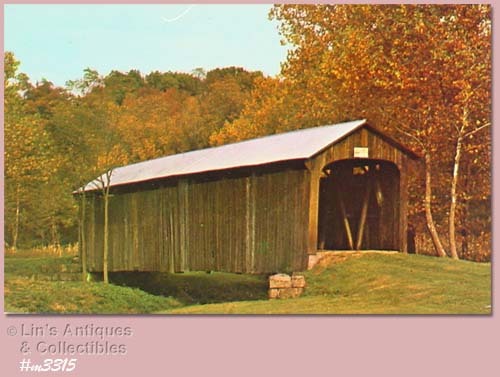 PER POSTCARD, THIS IS A PRIVATE BRIDGE AND IT’S “MORGAN COUNTY #2, KNOWN AS THE PORTER COVERED BRIDGE” LOCATED 2 ½ MILES WNW OF BRISTOL, OHIO. 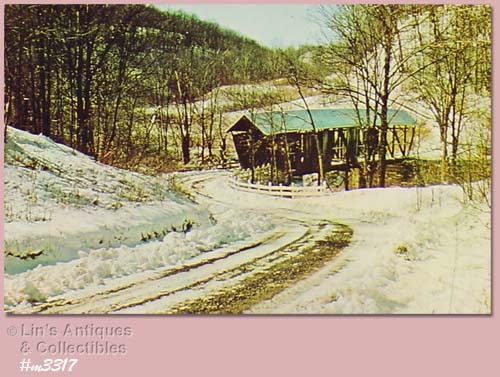 POSTCARD IS IN EXCELLENT CONDITION, HOWEVER, PRIOR OWNER WROTE “MORGAN 2” AND “REMOVED” ON BACK OF CARD. 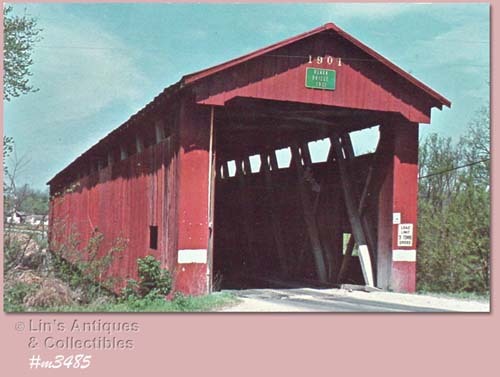 UNMAILED POSTCARD, “ILLINOIS COVERED BRIDGE”, CROSSES SANGAMON RIVER NEAR MAHOMET, ILLINOIS. UNMAILED POSTCARD, “COAL CREEK BRIDGE, PARKE COUNTY, INDIANA”. 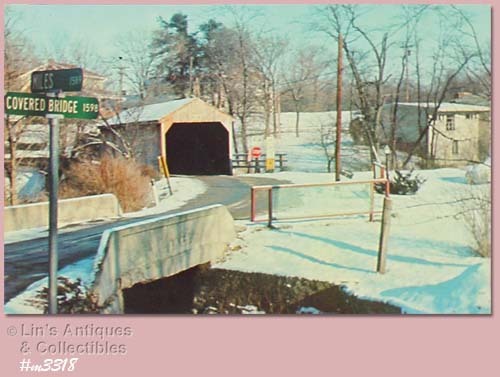 PER POSTCARD, BRIDGE WAS DESTROYED BY FIRE IN 1992. UNMAILED POSTCARD, “MILL CREEK BRIDGE, (TOW PATH BRIDGE)”, PARKE COUNTY, INDIANA. UNMAILED POSTCARD, “BRIDGETON BRIDGE”, PARKE COUNTY, INDIANA. UNMAILED POSTCARD, “CONLEY’S FORD BRIDGE”, PARKE COUNTY, INDIANA. UNMAILED POSTCARD, “MELCHER BRIDGE”, PARKE COUNTY, INDIANA. UNMAILED POSTCARD, “BILLIE CREEK BRIDGE”, PARKE COUNTY, INDIANA. UNMAILED POSTCARD, “MARSHALL BRIDGE”, PARKE COUNTY, INDIANA. 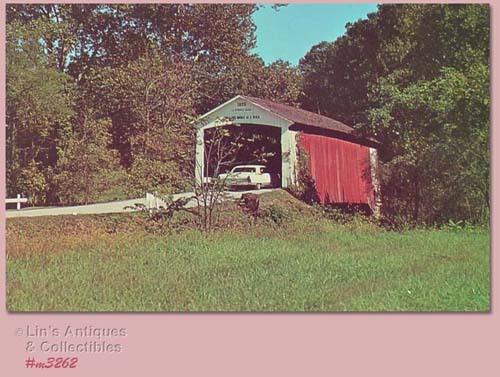 UNMAILED POSTCARD, “MONROE COUNTY, INDIANA, 14-53-02, MCMILLAN BRIDGE”.